I get several emails about gyros so I wrote this page to give a better understanding about them. This includes the most common questions about how the radio values correlate with the gyro. The number one confusion has to do with some radios using 0 to 50 and 50 to 100 to switch between heading hold and non heading hold while others use 0 to 100 and 0 to -100. This is the device that the rudder servo is connected to. The rudder servo connects to the gyro and the gyro plugs into the rudder channel of the receiver. It is used to sense sudden movements of the tail and it commands the rudder servo to compensate for it. Most people think it is to compensate for the wind, but that is not the real reason. I myself give examples of a gust of wind hitting the helicopter from the side, this is to keep the explanation simple but the real reason is to compensate for sudden loads on the main rotor. The tail spins at over twice the speed of the main rotor so if you lose 100 rpm from the head then you dropped over 200 rpm from the tail. The tail rotor is a lot smaller then the main and its effectiveness is highly dependent on the speed. So every collective and cyclic change you make effects the tail. Now keep in mind just because we have highly advanced gyros now does not mean you do not have to take this effect into consideration. Any gyro will work its best when you can keep the head speed constant. This means fine tuning both the throttle curve and cyclic mixing is important to achieving the maximum performance from your gyro. Basically you have two types, mechanical and piezo. I do not think anyone still sells the old mechanical gyros but if you bought a used helicopter it is possible you may have one. The mechnical gyros will have a buzzing sound coming from the sensor unit. They use an electric motor with two flywheels, one on each end of the motor shaft. And this is where the noise comes from. To understand how it works hold a spinning bicycle wheel by the axle and try to turn it, you will feel it resist you moving it. The flywheels in the mechnical gyro are mounted on a pivot and a sensor measures the deflection of the motor/flywheels when the helicopter makes a sudden movement. The piezo type gyros work with no moving parts. It uses a triangular crystal with a piezo element on each side. The piezo element is used in a lot of watches to make the beep sound from the alarm function. The material not only can make sound but also sense it. So it is used in both speakers and microphones. Two of the piezo elements on the crystal are set to sense vibration and the third one is setup to vibrate. When the helicopter is not rotating the vibration traveling through the crystal hits the other two piezo elements at the same time. When the helicopter is rotating one sensor will have a stronger signal then the other. It is a very efficient design and has a lot finer degree of resolution then the mechanical type. In addition power consumption is greatly reduced as there is no spinning motor to power. What is the difference between heading hold (hh) and standard rate (non-hh). In non-hh mode the gyro just dampens unwanted movements of the tail. To keep things simple lets say you are hovering and a constant wind hits the helicopter from the side, the gyro will keep the helicopter from suddenly swinging nose into the wind, but the helicopter will eventually drift nose into the wind. All the gyro does is to prevent any jerk type reaction. In hh mode the gyro will keep the nose pointed in the same place until you tell it to move. You can fly sideways with the rudder stick in the center and the nose will remain pointed in the same direction. If you have not used heading hold before then you will notice in fast forward flight that when you make a turn, the tail will not follow the helicopter, you have to give some rudder in your turns. Another thing is that you'll notice the rudder stick feels different. In heading hold, the amount you move the rudder stick from center tells the gyro how many degrees per second that you want the helicopter to rotate. The gyro moves the rudder servo however much it needs to obtain the requested rotation rate. With a standard rate gyro if you did a slow pirouette (one rotation) with the wind then to keep the helicopter spinning at the same rate you would have to move the rudder stick more as the tail is going upwind and less as the tail goes downwind. But with a heading hold gyro, it will tell the rudder servo to move more or less to maintain the constant rate, you just keep the rudder stick in one place. Due to typical marketing ploys you will see many names for heading hold. They all are just different names for the same thing. The different names are just because each company wants to make it seem like their version is more special then another companies. Rudder ATV (aka End Point, Travel Adjust) values? On a non-heading hold gyro this function in your radio is used to set how far the rudder linkage will travel. On heading hold gyros this function works completely different. It is used to set the maximum rotation rate. So what do you do about limiting the travel so as not to allow the servo to bind? Some gyros have a limit adjustment on them that you use to set this. The ones that do not require you to move the ball on the servo arm further or closer to the center of the arm to limit the travel. If you are using a heading hold gyro then the quick answer is no. The reason is that heading hold gyros are looking for a centered command from the radio to keep the helicopter from rotating. If you move the rudder trim a few clicks one way or the other then a gyro in heading hold mode thinks that you wanting it to spin in that direction. Example: Say you have switched to non-heading hold mode and the helicopter is rotating left so you add a little right trim until the helicopter is still. Now when you flip back to heading hold then you will find the helicopter now constantly rotates to the right. So how do you make it so the helicopter is trimmed in both heading hold and non? This confuses a lot of people because they often do the setup out of order. The first step is to center the trim and zero the sub-trim. Next with the gyro in heading hold mode adjust the sub-trim so the helicopter does not rotate. Normally this should be zero but due to small differences in the radios as well as some gyros you may find you have to adjust the sub-trim. The next step is to switch to non-heading hold and if the helicopter drifts, then adjust the rudder linkage. If the helicopter is drifting left then turn the link clockwise, opposite if drifting the other direction. This is another very common question I get. The cause is the reverse setting on the gyro. Do not get this confused with the reverse settings in the radio, that is not the same. To check the gyro move the rudder stick to the right, the control rod for the tail should be pulled toward the front of the helicopter. Next pick up the helicopter by the rotor head. Grab the tail boom and quickly rotate the helicopter so the nose goes to the left. Watch the control rod, it needs to move forward. If it does not then the gyro is backwards. Most gyros have a reverse switch or jumper located on the gyro, this is not done in the radio. A few gyros require you to turn the gyro upside down. This refers to the sensitivity of the gyro. When the gyro senses an unwanted movement it commands the tail servo to move in the opposite direction to compensate. How much it tells the servo to move is the 'gain'. Ideally the amount of gain should match how much the helicopter was rotated so that it stays pointed in the same direction and does not move. If the gain is too high then the helicopter over compensates. The effect you will see is the tail will bounce back and forth (aka wag). If the gain is not enough then you will notice the tail does not hold very well. When setting the gain, you want to turn it up until you see the tail 'wag' (bounce back and forth) then turn the gain back down until it stops. This type will have an adjustment on the gyro. It is usually a small pot that you use a screwdriver to turn. Different radios treat the values differently. On the Futaba 8U(super) the range in the gyro menu is 0 to 100. From 0 to 50 is one mode (such as heading hold) and 50 to 100 is the other. To fully understand this you have to look at it just as the gyro does. That radio sends a pulse from 1ms to 2ms to each of the connectors on the receiver. From 1ms to 1.5ms is one mode, say non-hh, and 1.5ms to 2ms is the other. The further it is from 1.5ms the higher the gain. On the 8U(super), 0 would correspond to 1ms and 100 would be 2ms. Now on the Futaba 9C it has 0 to 100 for hh and 0 to 100 for non-hh. So in the non-hh position 0 would be 1.5ms and 100 would be 1ms. In the hh position it sends pulses from 1.5ms to 2ms. Now to add a little confusion some radios allow the end points (atv's) you set to effect the setting you made in the gyro menu. So in other words if you have the gyro menu set at 100% but the end point for channel 5 is at 100% (with a range up to 150%) then instead of sending a 2.0ms pulse to the gyro (for maximum gain) you are only sending a 1.83ms signal which is about 65% of the actual gain in the gyro. Okay, so to help unconfuse you now, don't worry about the details. Just set your end points to 100% and 100% for the gyro gain too. Then if the tail wags lower the gain from there. If you have to go below 85% then move the ball on the servo arm in one hole toward the center and try again. What is the delay setting? This is a setting found on some gyros such as the popular Futaba GY401. It is used to compensate for slower servos. To set it do a quick pirouette and when you stop watch to see if the tail stops still or bounces. If it bouces then increase the delay to stop it. 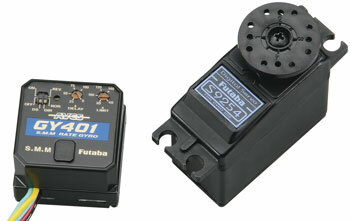 For a fast servo like the Futaba 9253 leave the delay setting at 0.